Only a few stops from Akihabara or Ueno on the Yamanote line Nippori station is a typical suburb of Tokyo. Or for that matter any Japanese major city. 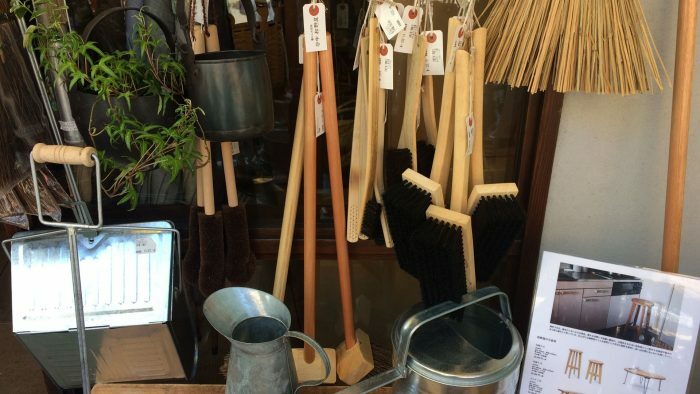 This April I visited for the first time in a long while the wonderful hardware shop Yanaka Matsunoya where you can buy endless amounts of 'old style' Japanese and Asian hardware items. My particular favourites are their own brand canvas bags called Plain which are bit like the Kyoto company Ichizawa Shinzaburo Hanpu's traditional canvas bags, and also the many brooms and natural fibre baskets. This place is always busy but a must visit if you are in Tokyo. Its a less curated version of Londons Labour and Wait. While the shop is great, these neighbourhoods are the soul of Japan where you can glimpse the locals going about their business and hear everyday conversations in the coffee shops and markets. A great way to spend a few hours away from the hustle of business life.